The classical industrial ethernet rail switches. Their compact design enables an economic start. These simple unmanaged switches offer plug & play functionality in the lower area of the network pyramid. The SPIDER family of switches provides users with an economical, yet highly reliable hardened Ethernet switch. All copper/RJ45 ports are auto-negotiating and auto-crossing -- the SPIDERs will work with either patch or cross-over cables. The 100 Mbps fiber ports are available in multimode (MM) and singlemode (SM) with either SC or ST sockets (Gigabit fiber is via SFPs). All SPIDER switches are extremely compact and have LED indicators that provide information on power status, link status, and data rate. 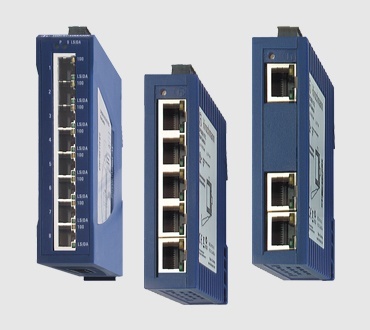 Enables a solid entry-level ethernet switch for industrial environments. These simple unmanaged switches offer plug & play functionality typically at the edge of an ethernet infrastructure. Provides fiber optic, Fast Ethernet, and Power over Ethernet( PoE) options.